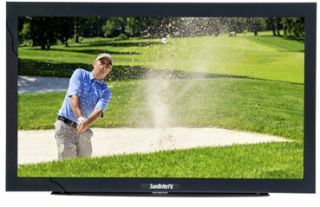 The What:SunBriteTV introduced the Signature Series SB-3270HD 32-inch and SB-4760HD 46-inch outdoor TVs. The What Else:SunBriteTV’s new design employs a new patented cooling system that allows for an impressively thin design while actually improving the unit’s ability to operate in extreme heat (up to 130° F). The new powder-coated aluminum exteriors deliver improved strength and durability and are far lighter than earlier models. The new bright LED panel further improves picture quality in a multitude of outdoor viewing conditions. The Why: “We’ve taken the best-selling outdoor TV in the world and improved it by leaps and bounds,” said Tom Dixon, VP of marketing, SunBriteTV. “Our new design features powder-coated aluminum casings that make the new Signature Series models 50 percent thinner but actually stronger and more durable. By adding newer, brighter LED displays, SunBriteTV will take the outdoor viewing experience to a new level. The Bottom Line: The new 32- and 46-inch Signature Series models are now available in black, silver and white colors for $1,495 and $2,895 MSRP, respectively.